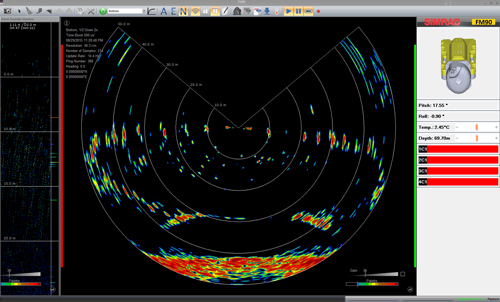 The Simrad FM90 is a flexible and feature-packed third-wire Multibeam Trawl Sonar. With a class-leading real-time image refresh rate, the FM90 provides a detailed live representation of the trawl. This fast refresh rate allows better trawl positioning so that you can maximise your catch and reduce the potential for expensive damage. This screen capture shows a typical catch situation with the FM90 in use. In the largest window of the display you can clearly see the trawl opening and the bottom. The view on the left side shows the echogram from one of the built-in echo sounders. On the right-hand side, you can see information from the catch monitoring sensors in use.